The Pro S-500T TURBO™ is 2 machines in 1. 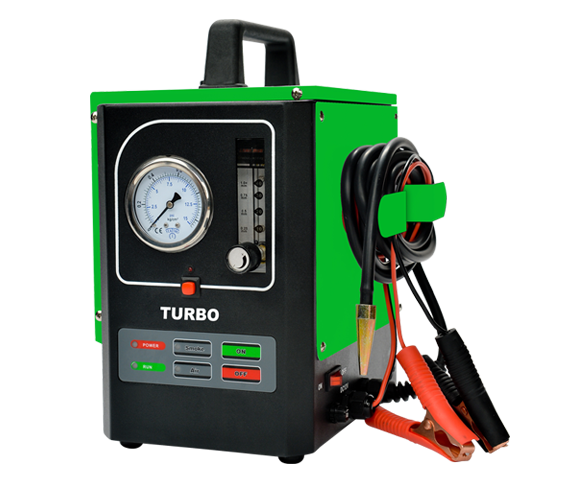 Equipped with a built-in air compressor the TURBO™ can perform all the above tests on both regular cars and light trucks and with the push of a button switch to turbo mode and test single turbo, twin turbo and supercharged vehicles. Along with the fully-equipped regular accessory case we include 2 newly redesigned Bladder Blockers™. Built In Air Compressor Making This Unit Totally Portable Whether In The Garage Or Any Place Where Needed. Charger System. When The Unit Is In Turbo Mode And Is Turned Off The Unit Will Revert Back To Car Mode. Will Shut The Unit Down If Anything Malfunctions. Using Your Automotive Scanner Tool To Determine What Is Wrong With The Vehicle / Turbo Charger. Then Using The Smoke Monster Turbo Is The Best Way To Locate The Leaks Fast And Saves You Time & Money. All content is ™ and © Proflex+ unless otherwise indicated.